The research-validated online assessment asks participants to respond to behavioral statements on a five-point scale, including application-specific questions to help determine the participant’s Management priorities preferences and tendencies based on the DiSC model. Built using the latest adaptive testing methodology, each participant receives precise insights to personalize their experience. 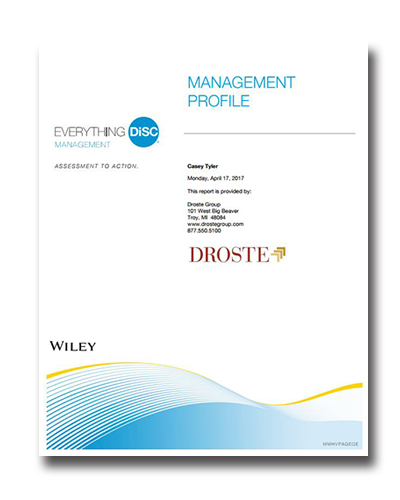 The profile comes to life with the Everything DiSC Management Facilitation Kit, offering a classroom experience that engages and educates. With a dynamic, modular design, a customizable presentation, and contemporary videos, your participants will walk away with a deeper understanding of their personalized profile and a memorable experience that inspires lasting behavior change.